Alejandro González Iñárritu’s The Revenant (B) blends western epic, revenge thriller and Christ allegory to often stunning effect on a blood-drenched American frontier. Leonardo DiCaprio gives new definition to suffering for one’s art as he undergoes a cavalcade of emotional and physical scars in an extremely gory story. In the grunts and groans of passages that feel like a silent movie with music, the expressive actor doesn’t miss a beat. He is a veritable force of nature, even if this isn’t the best use of his talents. Tom Hardy is very effective as the hero’s morally challenged foil. Iñárritu’s direction borders on overlong and overindulgent, but it’s hard to argue with all the lush camera work and scenery chewing when the stakes are this high. The spare dialogue serves to frame what is ultimately a man versus nature and man versus man battle. A little of this onerous oater goes a long way; and despite the palpable effects of all the violence and vistas, it doesn’t tread that much new ground. Quentin Tarantino’s hybrid western mystery gangster epic The Hateful Eight (B+) has all the trappings of the writer/director’s best work from outstanding ensemble acting to wicked dialogue to twisty plot conventions to pulpy action and inventive use of music. To some extent, it’s at times be too much of a retread of his most common conventions. Filmed as a Cinerama presentation in classic 70mm Panavision with gorgeous Ennio Morricine overture and an intermission, the saturated colors of this post-Civil War tale come vividly to life. Unlike his experiments with grindhouse double features, this homage to cinematic history pays off. As long as it is, it’s a film that nonetheless will reward repeat viewings. The pre-intermission proceedings appear to be too preoccupied with exposition and campfire tales before Act Two truly delivers the mixtape of Agatha Christie style mystery and vicious bloodbath that fans of the auteur will crave. Kurt Russell is impressive as a villainous vermin channeling John Wayne on a bad day, and Samuel L. Jackson steals the show as a charismatic bounty hunter with a surprising past and nearly all the film’s most iconic lines. Walton Goggins is a revelation as the sheriff of Red Rock with unlikely cunning, and Jennifer Jason Leigh unfurls a crackerjack of a performance as a duplicitous prisoner. Tim Roth, Michael Madsen, Bruce Dern and Channing Tatum are all effective in their roles. The only weak link, possibly from misdirection is Demián Bichir. Expect extreme language and violence and vintage Tarantino. It falls just short of some of his tighter and tidier work, but it’s more splendid fire in his canon. Samuel L. Jackson and Quentin Tarantino describe the “Roadshow” engagement and technology behind the film on TrailerAddict. Flawed and fascinating like its titular hero, Danny Boyle’s Steve Jobs (A-) is a biopic film seeking a new form factor. Told in three critical flashpoints of the computer industry titan’s life – namely, his launch of the overhyped Apple Macintosh, of the failed NeXT computer and of the wildly popular iMac that ushered in a new digital renaissance – Boyle and auteur screenwriter Aaron Sorkin fashion the tale of a fabulist impresario windbag who surrounds himself with people who act as fun house mirrors and lenses into his control freak world and undeniable genius. Michael Fassbender is simply phenomenal in the demanding and often unlikable role, with Kate Winslet and Jeff Daniels providing bright but thankless support as workplace foils to Jobs’ most repellant qualities. By jettisoning linear storytelling and embracing backstage patter, tone poem and near-requiem, the film is sure to confound most in its viewing audience. 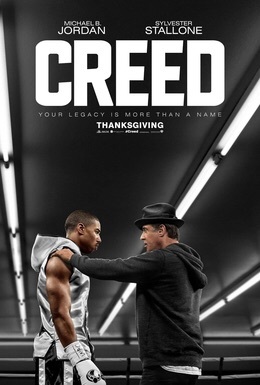 The movie’s distancing subject matter and petulant protagonist are near certain to be off-putting to most. Boyle rarely hits a false note and makes superb points about man and machine. Like underappreciated works of Kubrick, this austere film is likely to be better received years from now. It is telling that the movie focuses more of Jobs as artist than scientist, with his meta-theatrical launches taking place in symphony halls and his maestro metaphors falling from the lips like sweet sonnets. As film, it’s a perplexing and quixotic gallery. Given the early box office returns, it’s a fever dream most viewers will save for home viewing; but it’s absorbing for sure and nearly as odd and inventive as the man who inspired it. Related article: Learn PR tips inspired by Kate Winslet’s character on the Cookerly PR blog. 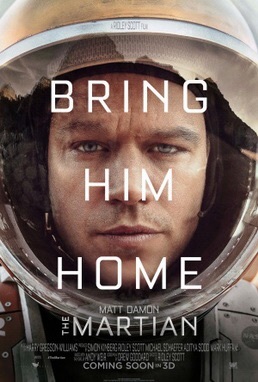 Given the amount of frustration most Americans have trying to function when they’ve lost a smartphone, it’s fascinating watching Matt Damon play an astronaut stranded on Mars having to go Full MacGyver, tapping into his brilliant scientific and survival skills to improvise in a world of limited food, oxygen, shelter, technology, human contact and rescue plans. In what is most certainly both Damon’s and director Ridley Scott’s best film in years, The Martian (A) excels as a saga of persistence and problem solving, including narrative flourishes to continually up the stakes in what could have otherwise felt like a long slog to resolution. Scott deftly marshals seamless effects and an impressive supporting cast of characters summoned to kick off global and interplanetary collaboration to bring the hero home. Some of the roles are cast too well given limited screen time (Do we really need Kristen Wiig as stern PR counsel or Sebastian Stan as a NASA scientist with collectively less than a dozen lines?) Damon brings effective swagger and likability to the central role, and the actor’s penchant for working with prestigious directors pays off big time here. Scott does both human drama and outer space adventures well, and this one is one of his best. Related article: Learn PR tips inspired by Kristen Wiig’s character on the Cookerly PR blog.